What separates winning teams from losing? You might say – star players, coaching, money… Yes, it’s all those things, but above all, systems and discipline. The team that runs like a swiss clock means business. Preciseness in practice, preparedness during the games. Interestingly we are seeing more and more young coaches praising technology for their coaching success. Today’s article is prepared to share a little light on such success stories. Toni Johansson, the men’s handball team assistant coach knew that to get results he had to think out of the box. With his curiosity for technology and emerging tech trends, he found an opportunity to gain a winning edge. Used strategies stretched from instant video clip cutting, team scouting profile creation and not to mention, the most dangerous weapon of them all – penalty shot image diagrams that drastically increased goalie rescue rates. During the U18 Championship, I was an assistant coach and I provided the head coach with detailed clips about the opponents. We decided to find things in the opponent’s game that could help us to gain 4-6 goals in every game. Therefore, we realized that it was crucial to analyze each match during the championship with the XPS Network it helped us to create an overview for each team. With the help of XPS Network, we also created a nice overview of each player’s shot image and on the penalties, we had a very high rescue rate due to the goalkeepers having read the shooters and done their homework. How players are involved in the process with technologies? In HK Aranäs, where I am a coach, we use XPS daily and it has become an integral tool for our team. The players have a great deal of use of the XPS Client app because they can get push notifications when I as a coach want to get information very fast. With the help of the XPS Client app I also get a faster feedback to the players. For example, I can send out individual clips from the last match on their own performance. This way, we get an increased metacognition with the players and they can analyze their own performance quickly and easily. We have also begun using the XPS Network to design our own individual strength and conditioning workout programs, which is then sent out individually to each player and they mark it completed in the app after completing the pass. As a coach, I get a very quick feedback on what the players have done and not done. Each player can also see his own latest test results and also the progression that has taken place over time at the gym and using the Playbook tool, I’ve created our entire game book and then uploaded to the players so it can be read. Prior to each match, we have also created a document with the analysis of the opponents that they can easily pick up on the phone and read on, for example, the bus trip. Do You Think Every Coach in Sweden is Using XPS Network? I know that in the highest series, almost every team uses XPS Network as an analytics program. 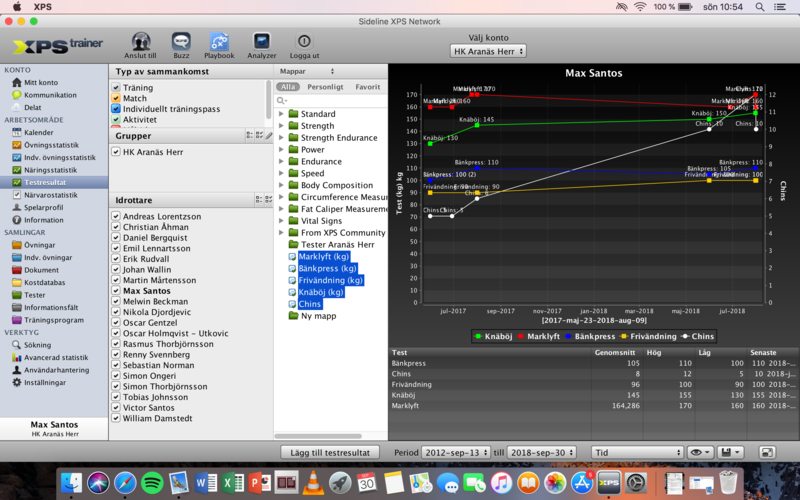 Even Swedish men and women teams have used the XPS Network when it comes to the analyzed of opponents during the championship. What can you recommend and suggest young coaches from other countries regards XPS Network? I started using XPS when I was 23 years old and have since expanded usage for each year. Now that I’m 28, I’m using XPS and the app fully. For me, XPS Network has helped me in the way that I have everything in one place. The coach with a structure is much more organized and sees bigger picture things. I think every young coach should make this a priority when starting to build their careers. For example, it is very helpful to use the calendar function and insert the entire team’s program. It is also of great benefit that everything changes in real time in the players’ app when I make changes and in this way, I know that no player misses any important information. Final notes – if you’re looking to get started with smart technologies take advantage of 30-day free trial from XPS Network.